The International Securities Lending Association held a briefing last week which disclosed some good industry level data on stock/security borrowing: the arrangements that facilitate shorting. One of the effects of the Credit Crunch of 2008/9 was that counterparty risk became a major concern. Who you lend to, the quality of collateral, and documentation related to these factors became major operational issues. In a climate in which it became difficult to know for sure who would be around to deliver either collateral or borrowed securities back again the next week, it was inevitable that the willingness to lend declined. Graphic One illustrates that the assets available to borrow fell by 30% in the 4Q of 2008. 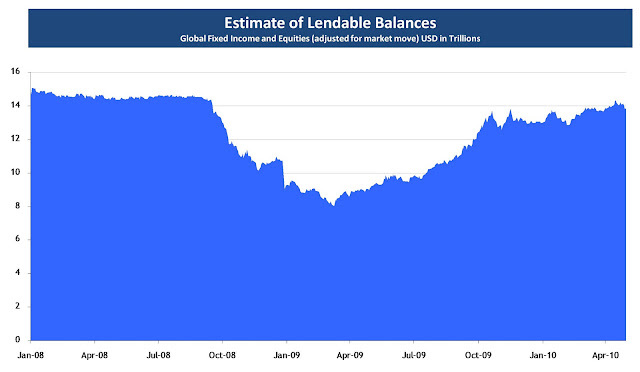 The low point for lendable assets coincided with the low for equity markets in March 2009. As a result of implicit government guarantees and the move to bank holding company status for some banks, clients regained comfort with the securities lending market, and lendable assets have been increasing to pre-Crunch levels. Whilst the willingness to lend has returned to levels seen previously, the desire to borrow securities has not returned to anything like the same degree. 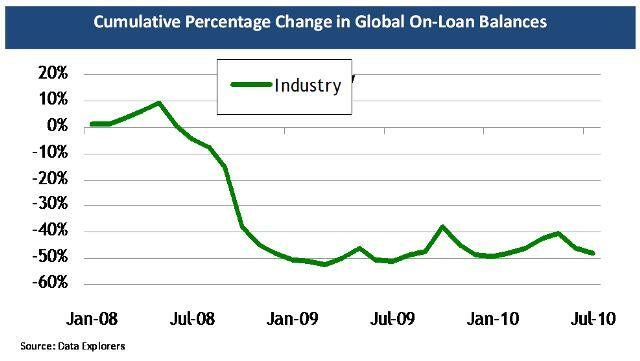 On-loan balances, that is the amount of securities actually borrowed, remains at around half the level seen in the first half of 2008 (see Graphic Two). There are a number of reasons why the volume of securities borrowed has declined and stayed at a new lower level. The borrowers of securities would be hedge funds and proprietary trading teams. Capital in the hedge fund industry dropped by 40% from mid-2008 to mid-2009. In the period of the Credit Crunch proper the capital used by prop desks was needed elsewhere in the businesses. In the period after there were regulatory inhibitions on capital devoted to prop trading. For both types of borrowers of securities many of the those that engaged in running funds or prop capital had reduced risk appetites or measured such high correlation and volatility in the markets in which they traded that they need less capital to put the same amount of risk on. Of course another, if not the, major factor was that financing new borrowings of any sort became extremely difficult - so leverage fell across all activities funded by short term borrowing, including prop trading and hedge fund position financing. The massive de-leveraging is illustrated in Graphic Three, which shows a 62% fall in leverage from 2008 to 2010. Capital allocated to prop desks today is down by an estimated 90% from the 2008 levels, and will go lower as banks such as Goldman Sachs and JP Morgan have announced they will withdraw from the activity. Securities are borrowed in order to carry out a number of shorting strategies: hedging activity to offset long exposures, arbitrage trading to capture mispricing opportunities, and strategies to benefit from corporate changes such as mergers and acquisitions. 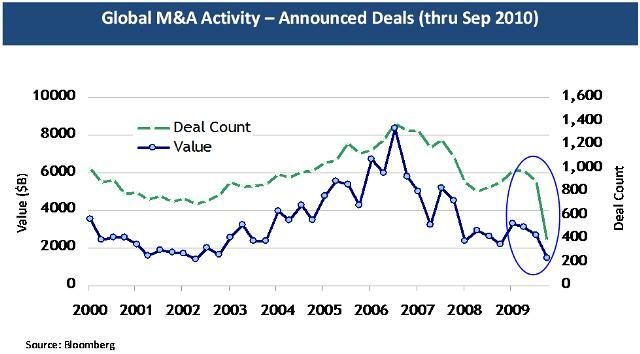 Whilst there may still be a need for large scale hedging, and there have been gross arbitrage opportunities in the last 18 months, the volumes of M&A deal flow have been down significantly (see Graphic 4). The data generated and shared by the International Securities Lending Association also prompted a constructive thought for the hedge fund industry and those who invest their capital in it. A lot of great investment talent is coming out of the investment banks. Not all of them will thrive within independent businesses, but the precedent is strong. A lot of the best talent running big hedge funds now have come out of Goldman Sachs and JP Morgan, and they won't be the only banks to run down their proprietary trading desks further. Let's hope the new wave can reinvigorate hedge fund returns in 2011.